Adelady (#6), by first crop sire Dominyun, qualified with the fourth fastest time to the $410,000 Oklahoma Futurity(G2) on Saturday night at Remington Park. OKLAHOMA CITY, OK�MARCH 7, 2015�The second night of Remington Park�s Opening Weekend for the 2015 American Quarter Horse Season featured 15 trials for the Oklahoma Futurity. Ruidoso Derby(G1) runner-up DOMINYUN got his first of two winners on Saturday's race card when Joyce and Troy McClennen's Adelady defeated The Charm Of Corona in the fifth trial while posting the fourth fastest clocking of :15.507 seconds. An $8,000 repurchase in the Heritage Place September Yearling Sale by her breeder Bobby D. Cox, Adelady was resold in the Fall Mixed Heritage Place Sale for $15,000 to the McClennens. Rodney Reed conditions the filly out of Game Snowlady, by Game Patriot. Champion jockey G.R. Carter, Jr. had the riding assignment. DOMINYUN second winner of the night came in the Race 12 when Bp Judsen won for owner/breeder Bill Price. Rodney Reed saddled the gelding out Bp Southern Mariah, by Southern Cartel. The Grade 2, $410,000 Oklahoma Futurity, the longest-running futurity in Quarter Horse racing, will be contested on Saturday, March 21. This will be the 74th edition of the Oklahoma Futurity, carrying the richest purse in its history. 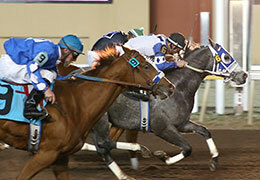 Bp Judsen, by Dominyun, winning his trial for the Oklahoma Futurity on Saturday at Remington Park. For the complete list of qualifiers to the Oklahoma Futurity(G2) including times, sires, dams, owners, breeders, trainers and jockeys CLICK HERE. Trainer Rodney Reed saddled four winners on the night but managed to qualify only Adelady to the Oklahoma Futurity. Open daily at 10:30am for casino gaming and simulcast racing, Remington Park features the Bricktown Brewery on the casino floor. Admission, general parking and valet parking are always free at Remington Park, home of the historic 74th Oklahoma Futurity on Saturday, March 21. Tracked by over 78,000 fans on Facebook and 6,100 Twitter followers, Remington Park is Oklahoma City�s only Racetrack & Casino and is located at the junction of Interstates 35 & 44, in the heart of the Oklahoma City Adventure District. For more information, reservations and group bookings please call 405-424-1000, 866-456-9880 or visit remingtonpark.com.